Hide this Project (Meena Residency) Discover properties in other projects by hiding the ones that doesn't interest you. You won't see them in your searches further but you can unhide anytime later. Hide this Dealer (Varad Realtors)Discover properties by other dealers by hiding those whom you have already spoken to. You won't see them in your searches further but you can unhide anytime later. Hide this Dealer (Sarveshwarnath Enterprises)Discover properties by other dealers by hiding those whom you have already spoken to. You won't see them in your searches further but you can unhide anytime later. Hide this Dealer (Kailash Parvat Homes)Discover properties by other dealers by hiding those whom you have already spoken to. You won't see them in your searches further but you can unhide anytime later. Hide this Dealer (Jai Shree Ganesh Realtors)Discover properties by other dealers by hiding those whom you have already spoken to. You won't see them in your searches further but you can unhide anytime later. Hide this Dealer (Katyal Estate & Investments)Discover properties by other dealers by hiding those whom you have already spoken to. You won't see them in your searches further but you can unhide anytime later. Meena Residency, located in Mumbai, is a residential development of Meena Buildcon Properties. It offers spacious and skillfully designed 2BHK and 3BHK apartments. The project is well equipped with all the basic amenities to facilitate the needs of the residents. The site is in close proximity to various civic utilities. Where is Meena Residency located? Sector 36 Kharghar, a prime residential locality for house seekers in Mumbai Navi. What size of flats are available in Meena Residency? The apartment sizes in the project vary from 1175.0 sqft to 1660.0 sqft. What is size of 2 bhk in Meena Residency? The area of 2 BHK apartments ranges from 1175.0 sqft to 1196.0 sqft. What is the 3 bedroom size in Meena Residency? The area of 3BHK units in the project varies from 1655.0 sqft to 1660.0 sqft. What is total size of Meena Residency?The project is built over an area of 0.5 Acres. What is total price of 2 bhk in Meena Residency? The price of 2 BHK units in the project ranges from Rs. 8300000 to Rs. 8500000. Hi everyone! I am planning to buy a joint property in this project with my friend and would like to know the configurations offered. Does it have RCC framed structure? @Shyam, Kharghar is a developing area and has witnessed some rapid development in the last few years most of which has taken place in sectors 10-15, 19 and 20. On the other hand, Sector-36 is a little far off from these sectors. Despite the presence of basic facilities here, the sector lacks basic civic infrastructure. I believe it will take some 5-7 years from now for the sector to develop fully. If you are looking for end-use, I would advice you to look out for options in sectors 10, 11, 12, 13 and 20 because of the availability of a number of ready-to-move-in projects here. For investment purpose, sector-36 is a good bet. But make sure that you have a lock-in period of 5 years. Also, it wont be easy to find a tenant which means that you will lose on rental income. Dear Shyam, the building has earthquake resistant RCC Framed structure along with specifications like vitrified tiles in throughout the home and ceramic flooring on attached terraces, POP finished interior walls with high quality distemper, branded sanitary ware with CP fittings of premium quality, aluminium powder coated sliding windows and ISI marked modular switches and sockets of anchor. It is developed by Meena Buildcon Properties and is located in Sector-36, Khargar, Mumbai. 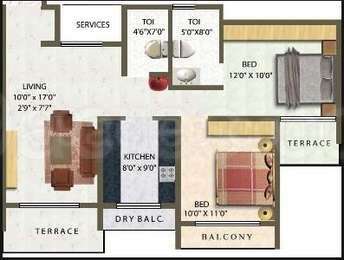 You get configurations including 2 and 3 BHK with an area ranging between 1175-1196 sq. ft. and 1655-1660 sq. ft. respectively. Cost of a 2 BHk ranges between Rs. 88.12- 89. lakh while a 3 BHK costs Rs. 1.24 Cr.